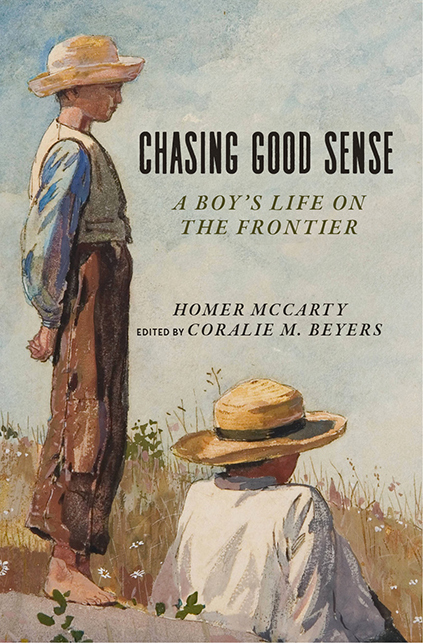 In this creative memoir, Homer McCarty adopts the voice of seven-year-old Buck to recollect his own life growing up in rugged southern Utah Territory in the late 1800s. Although Buck’s reflections are necessarily imprecise—gathered from fragments of memory and then embellished freely—the stories he tells are an honest look at life on the frontier. In the spirit of Huck Finn, Buck embarks on adventures and mischief with his loyal friend, Earl. Naïve, eager, and inquisitive, he seeks to make sense of his world. McCarty’s portrayal of the period is often humorous, capturing the intimacy of place and family through a young boy’s eyes. McCarty completed this work in 1948. Had it not been for a series of fortuitous events and the dedication of his granddaughters, including Coralie Beyers, these pages would have been lost. Thanks to her efforts, her grandfather’s lively, entertaining book is now available for readers to relish and enjoy. Homer McCarty (1868–1954) was a schoolteacher, mineral surveyor, owner of a drugstore and mercantile, and editor of the Sevier Valley Sun. He retired in 1940 and spent the remainder of his years writing. Coralie McCarty Beyers (1926–2017), granddaughter of Homer McCarty, was an English professor at Utah State University. An author, poet, and gifted artist, she is the editor of Man Meets Grizzly, which recounts her maternal grandfather's stories of bear encounters during the settling of the western frontier.